Obligatory first day of school year photo – Year 2 and Reception. Generally we try to discourage the competition because it invariably ends in tears especially considering the amount of cheating that goes on. It doesn’t stop the kids being competitive though, particularly Lex who is driven to be first in everything even if it is a race to the bottom. The competition is hotting up though in one arena – swimming – where Tilly is gaining quickly on her older brother. It’s always been important to me that my kids learn to swim well – I am half South African after all – and so both big kids have had lessons for a while. Since starting on the ‘proper’ stages (rather than the waterbaby/duckling levels) Lex has taken on average just over 2 terms to move to the next stage (he’s now on his second term of Stage 3). His lessons involve him trying to get to the bottom of the pool (not generally a regular requirement), mucking about with the other kids and trying to be the one who gets to sit on the pool ladder. Needless to say, listening to the teacher is low on his priorities and so, despite lots of early potential (and stern words from his mother), his progress is forwards but slow. Tilly is a bit different. Tilly likes to please the teacher, listens, copies and observes. 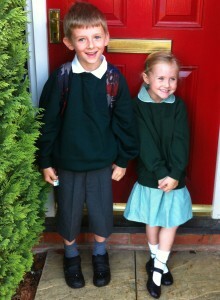 I had a bit of a quiet proud mummy moment when she was moved to Stage 1 before she had even started school. When she then passed that and was moved to Stage 2 she proved how hard she had worked over the previous term. Of course now we have an issue (for Lex) in that Tilly (age 4) is only 1 stage behind Lex (age 6). Today was the first day of the new swimming term. I had forgotten Tilly’s goggles and so she spent most of her lesson trying to scrape the water off her face but was ever so proud that she’d managed to open her eyes under water. Lex swam like a demon. A couple of minor instances of silliness but on the whole a lot of determined swimming. He doesn’t want to end up in the same class as his sister and that is a distinct possibility if he doesn’t pull his finger out. Sometimes a bit of sibling rivalry helps you find your focus (I’m sure his teacher will be relieved). This entry was posted in Kids and tagged competition, lex, sibling rivalry, swimming, tilly by twigletmac. Bookmark the permalink. We have a bit of this with my little two ( 4 and 6). DD3 is the elder of the two and she has suddenly started working harder since her little brother was moved up into her class. Ours aren’t allowed to wear goggles until they are doing lengths of strokes. There are a lot of canals and waterways around here and our swimming teachers tell us they need to know how to swim if they fall in water, not be freaking out about water getting in their face. It makes sense, but they much prefer to swim with goggles on so I do let them wear goggles in our pool. I was fairly resistant to getting Tilly goggles (Lex has never needed them and I was hoping that she would get over her issues with water in her face) but they’ve made such a difference to her confidence in the water. Half the time when she has them they’re on top of her head – they’re a bit of a security blanket really. Although our teachers have never discouraged them I wish they would – so many kids (even in the toddler classes) have them it would make more sense to focus on getting them used to having their face in the water without, especially when they are little.